The Diva challenge of this week is to use YUMA in your tile. So for me a challenge to learn a new pattern. A quick look at tanglepatterns.com and I can start. And oh yes, on wednesday there are already many beautiful examples on the Diva site weekly-challenge-189.html so inspiration enough to make my own tile :). On the patterns site I came also across the pattern Crescent Moon, and I used that in my tile in combination with Yuma and a little Diva Dance flower. 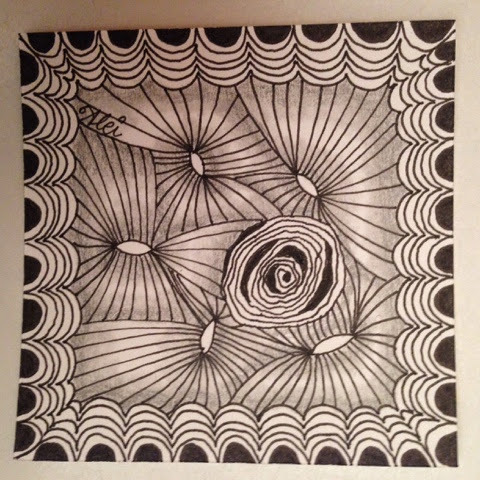 It did not take that long to make a nice zentangle with these patterns, and I made another one with a variation of Yuma. 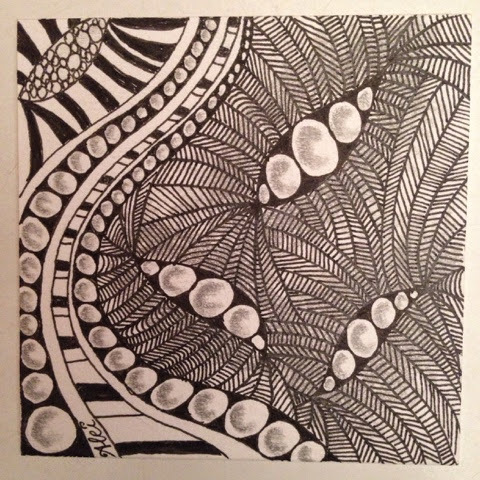 I filled the space between all the lines, and I also filled the leaves. Looks nice to me ! 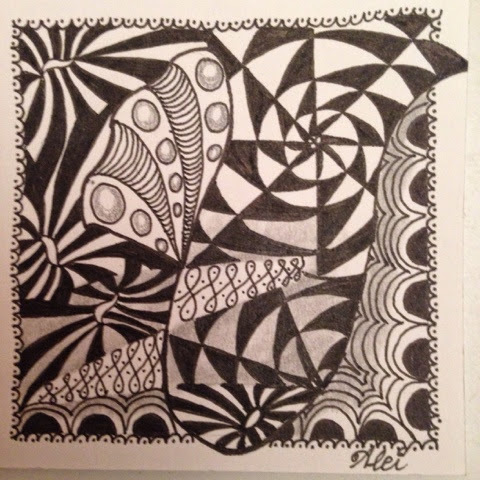 The third tile I publish here is a tile I made for a challenge of some weeks ago "draw a string with your eyes closed, and fill it with patterns". I didn't have time to finish is then and I added Yuma and Crescent Moon to it today. Little shading and finished now. Al 3 are very beautiful. The first one look Great with crescent moon and diva dance, good combination. The second one of Yuma is very special with the beautiful pearls inside. Lovely al. excellent, thank you so much. i love to see YUMA together with crescent moon and diva dance. I like the herringbone pattern between your Yuma lines. It adds a great texture. Je bent druk geweest en met een prachtig resultaat!!! All are very lovely! Especially I like your tile with Yuma. Wonderful the combination with Crescent Moon! I enjoyed all three tiles, very well done.